Ada Garcia-Poll, a junior at Buffalo State, was named a 2017 Newman Civic Fellow by Campus Compact, a non-profit organization working to advance the public purposes of higher education. Garcia-Poll is one of 273 students across the country who will make up the organization’s 2017 cohort of Newman Civic Fellows. “Ada is an outstanding member of the Buffalo State community and a superb representative of Buffalo State’s civic and community engagement efforts,” President Katherine Conway-Turner wrote when she nominated Garcia-Poll for the fellowship. Conway-Turner cited Garcia-Poll’s involvement with the Alternative Break program beginning in Garcia-Poll’s first year. As a sophomore, she became a site leader for an Alternative Spring Break program in Detroit, Michigan, and she was asked to join the Alternative Break Leadership Team. She has also demonstrated both her commitment to service and her leadership skills in other programs and events, including “Say Yes Syracuse” and, at Buffalo State, Random Acts of Kindness Week and the college’s annual Bengals Dare to Care Day. In Buffalo, she has worked as a tutor providing homework help and educational enrichment for urban youth through the XCEL program. As a 2017 Newman Civic Fellow, Garcia-Poll will take part in a one-year experience emphasizing personal, professional, and civic growth. Through the fellowship, Campus Compact provides a variety of learning and networking opportunities, including a national conference of Newman Civic Fellows in partnership with the Edward M. Kennedy Institute for the United States Senate. The fellowship also provides fellows with access to exclusive scholarship and post-graduate opportunities. 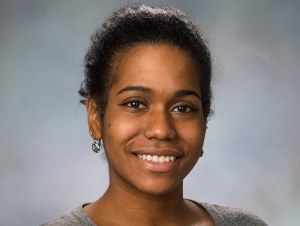 Congratulations to #buffalostate's first Newman Civic Fellow, Ada Garcia! Ada is a junior & has been connected to the #VSLC through her involvement with the #alternativebreak program since freshman year when she participated in Alternative Fall Break 2015 [see picture]. Since then she has served as the Site Leader for Alternative Spring Break 2016, Public Relations Co-Chair on the AB #student #leadership #team, Bengals Dare to Care Day site coordinator, and VSLC student staff member! We couldn't be more excited and proud of you. Thanks for choosing #buffalostte!